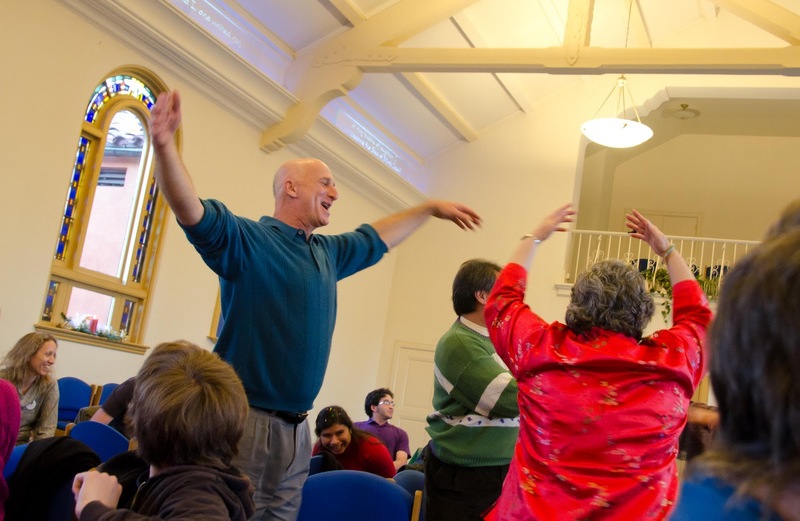 Our always-gorgeous Christmas services had some new tweaks this year. 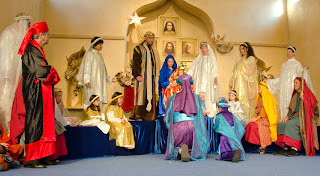 The family service on Christmas Day featured the same live creche, but with an extended cast of smaller angels, shepherds, and wise men enacting Asha’s telling of the Christmas tale. 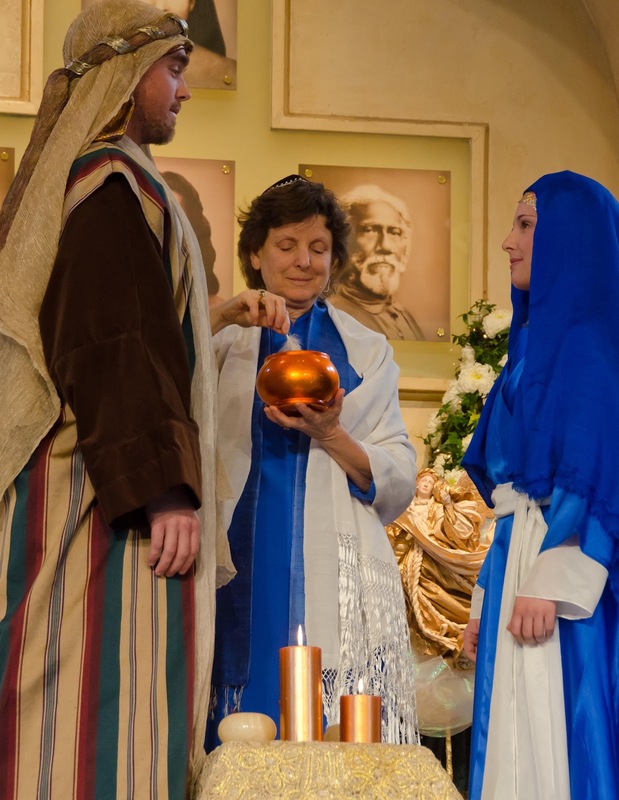 This year also included a sweet new scene in which Asha donned a yarmulke and played the part of the rabbi marrying Joseph and Mary. After the service was the Christmas banquet. 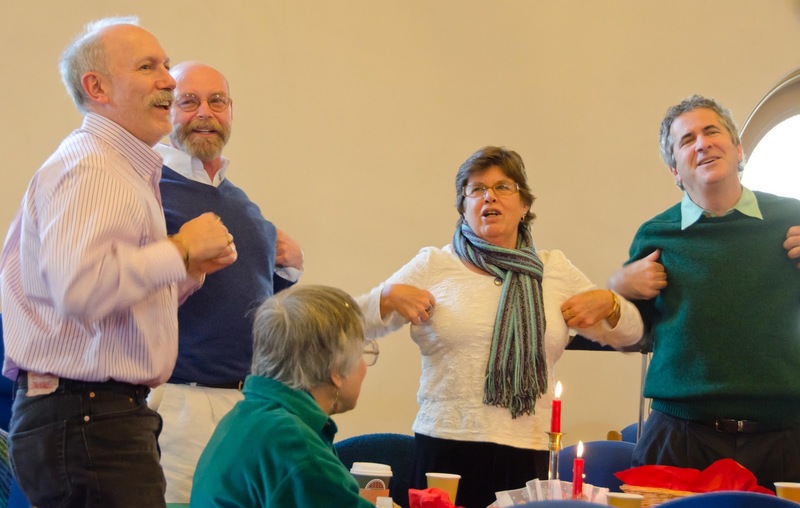 The grand finale of the day involved a rendition of “The 12 Days of Christmas” that outdid even our enthusiastic attempts at the Christmas parties. 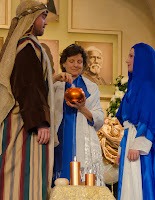 The days were assigned to different tables, and the gifts were acted out with great alacrity and gusto! 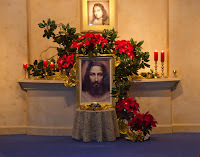 More photos of Christmas Day are here. Merry Christmas to all! 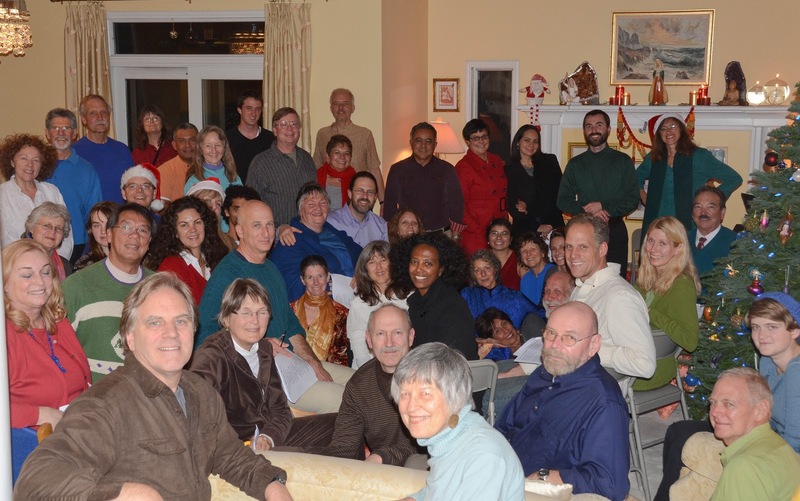 This weekend we celebrated what may traditionally be known as “Duality Awareness Week,” in which we juxtapose our most inwardly-focused and outwardly-focused Christmas celebrations. Representing the inward direction, Saturday was our annual 8-hour Christmas meditation. 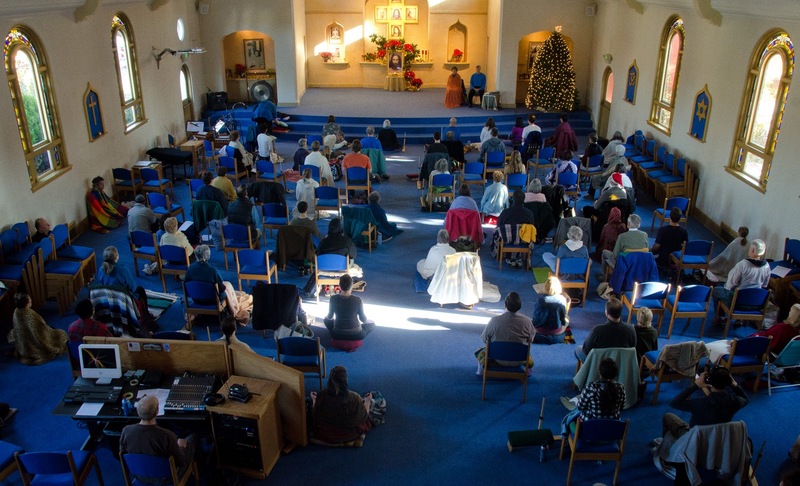 Many devotees gathered in the temple for a day of meditation, interspersed with chanting and recordings of Master and Swamiji. A few lovely photos are here. 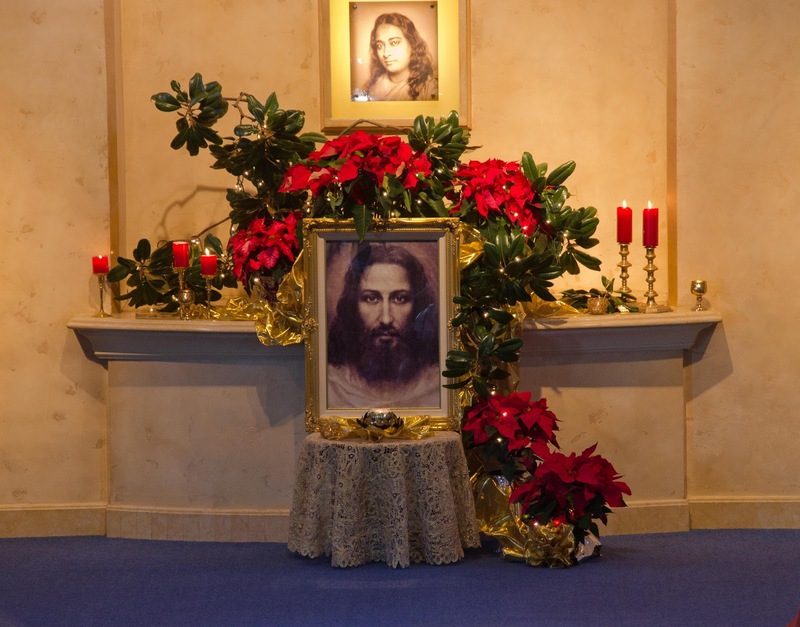 May you feel Christ’s presence within you and around you this Christmas season! 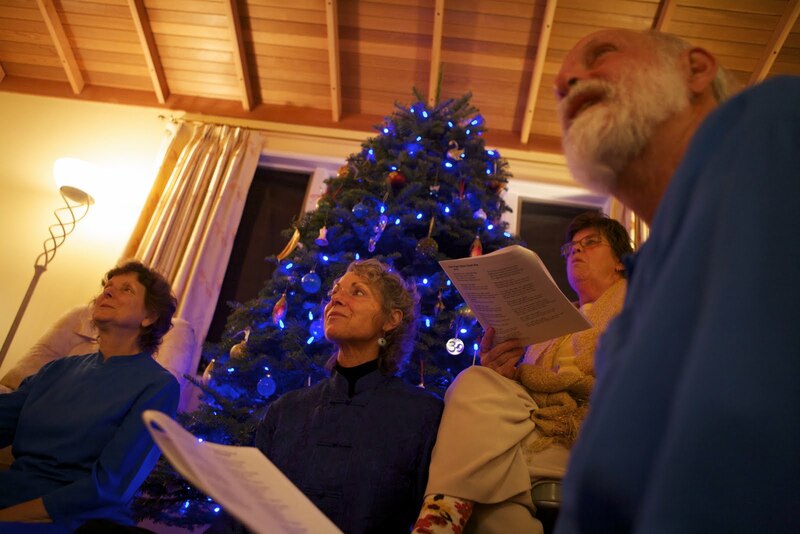 After the eating, socializing, and satsanging, came the singing (an excellent warmup for when we’ll take the carols around the neighborhood next week.) “The 12 Days of Christmas” was a particular winner, both nights. Helen got us organized into 12 groups to coordinate the singing of all the different gifts, and would have had us acting them all out as well, if we’d had any space to maneuver in at all. Shanti led the charge the second night, in what became an even more rousing rendition, thanks to our previous practice. A glitch in the very last verse tempted some people to start it over from the beginning but they were, luckily, outnumbered. We did manage to get a group photo, but only on the second night. Imagine this times two. More photos can be found here. 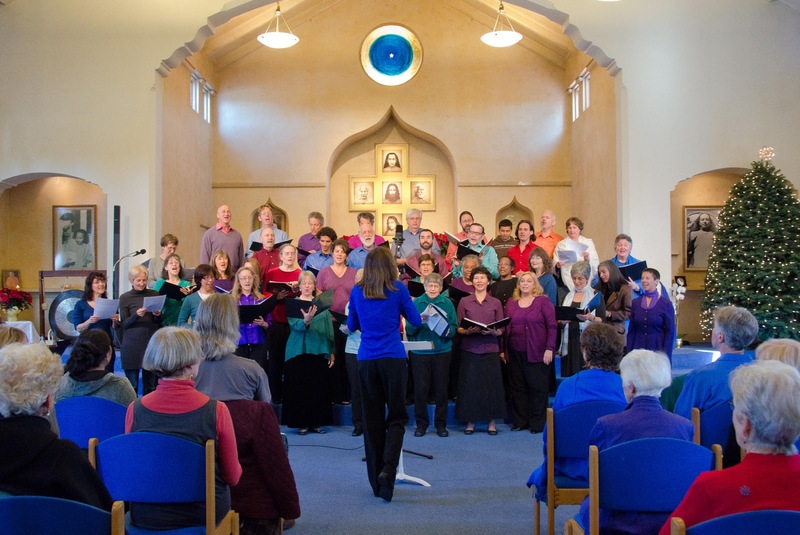 On Sunday, the Ananda Palo Alto choir put on its annual Christmas concert, following service. Well, following lunch following service, that is, which is a very popular way to have concerts around here these days. Many volunteers provided the main dish of vegetarian chili and cornbread, along with numerous other potluck items. We probably fit over 100 people into the yoga studio with all our tables deployed, but the weather was nice enough for folks to spill out into the courtyard as well. After lunch, we shepherded everyone back into the temple for the concert (much of which was videotaped and photographed). The festivities opened with a women’s ensemble marching in with a rousing rendition of “Alle Psallite,” complete with drum, tambourine, and kirtals. 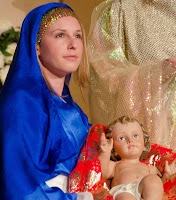 The rest of the program was arranged thematically, starting with songs to Divine Mother (Mary), and moving through the birth of Christ, the rejoicing, and culminating in His Power (you can guess which song that was). One of the fun things about the Christmas concert every year is that the choir gets to add a few new songs to their repertoire. And lots of good Christmas music has been written over the centuries, so we always manage to find a few gems. Dambara’s spellbinding performance of “I Wonder As I Wander” in the middle of the program really seemed to shift the experience of the entire concert to a deeper level. 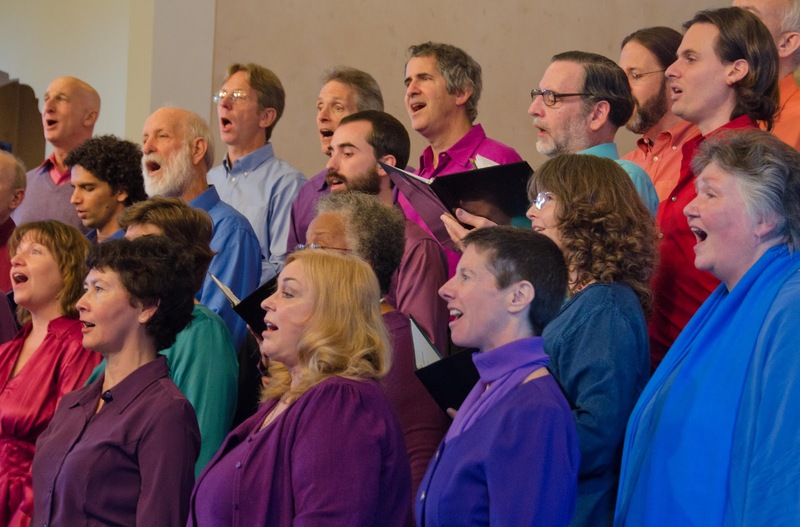 An ensemble sang Bach’s arrangement of “In Dulci Jubilo,” in a mix of Latin and English. And the whole choir plus numerous audience members sang the tremendously glorious — you guessed, right? — Hallelujah Chorus. 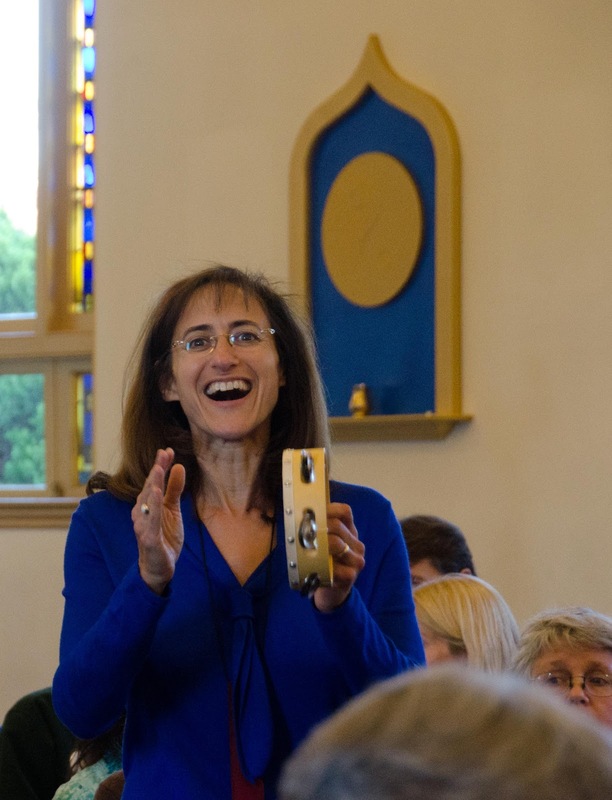 Inspired to start singing yet? 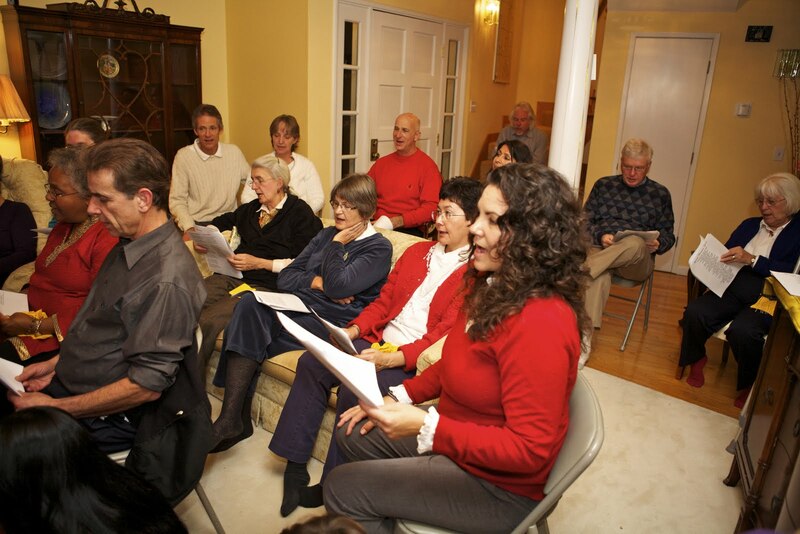 Join us for Christmas caroling on the 18th!